Andrej Pejic interview for The Cut. Andrej speaks on being crowned prom king AND prom queen plus the most overused phrase in fashion. 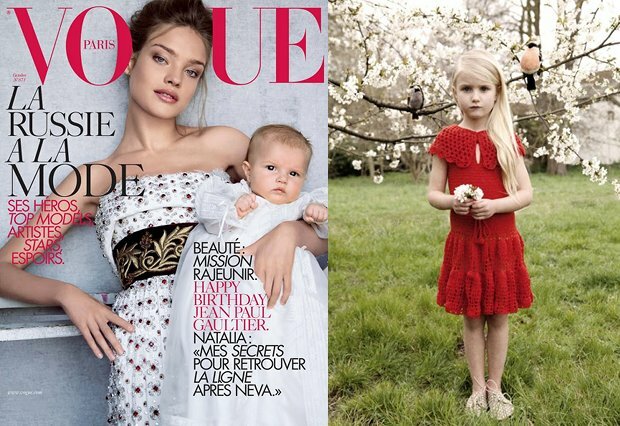 Natalia Vodianova’s mini-me model daughter. If ever a child was born to be a model, it is little Neva Vodianova Portman. As a newborn, she graced the cover of Vogue Paris, and now at a tender six years old, she is modelling for Caramel Baby & Child. Wearing a gorgeous cashmere dress and matching collar designed by her beautiful mother Natalia, with the proceeds going to Natalia’s The Naked Heart Foundation. Manish Arora to leave Paco Rabanne. Gosh, after just two seasons as Paco Rabanne’s artistic director, Manish Arora is set to leave. According to the label, he was bought in to relaunch the brand. Now that he has achieved that, he is out and someone else will take the helm. It seems like a strange reason for his short-term tenure, though the decision seems to be mutually amicable. There’s no word yet on who is to replace Arora. Carine Roitfeld styles pregnant daughter Julia for i-D magazine. How utterly stunning does Julia Restoin-Roitfeld look? She looks nothing less than perfection in some beautiful lingerie and an Alexander McQueen cape, shot by Mario Sorrenti. What do you the cover? 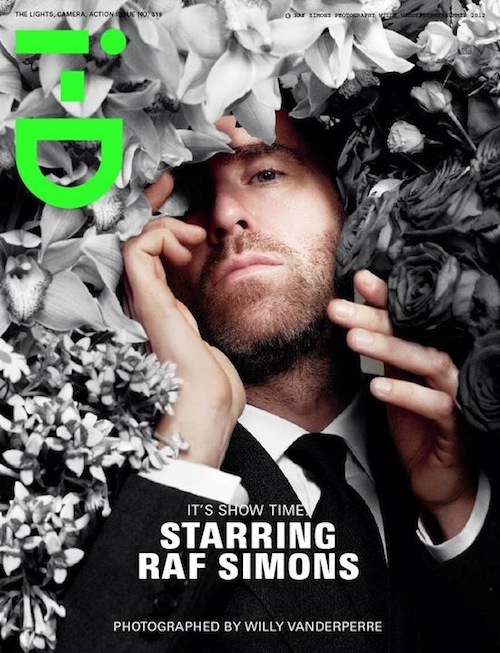 Raf Simons’ cover shot for i-D.
Fashion’s man of the moment, Raf Simons has also been shot for i-D’s new issue. After a tumultuous few months, being dropped by Jil Sander and then named as John Galliano’s successor at Dior, this really is Raf’s time. Iris Apfel’s newest venture: Extinction. Such exciting news. One of my favourite fashion muses, Iris Apfel, is set to launch a handbag line! It’s the latest in a long line of ventures for the more-is-more fashionista, including a glasses collection and a collaboration with MAC. The collection features exotic fabrics such as Mongolian lamb and snakeskin but is pretty reasonably priced, from $228 up to $398. 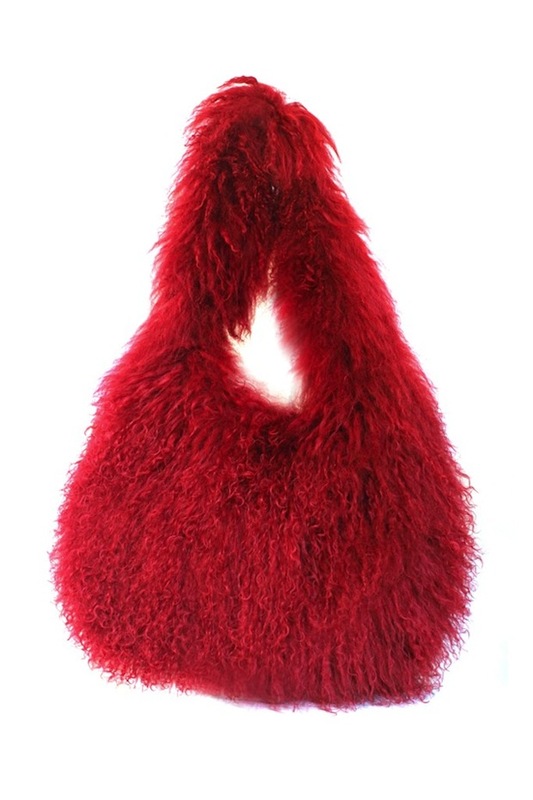 Will you be buying a super-eccentric handbag, complete with dodo tag? The news story of the week, street style favourite and Vogue Nippon editor Anna Dello Russo is set to collaborate with H&M on an accessories collection. Mark 4th October in your calendar, kids, this is going to be a killer collab. Anna says: “I wanted to create precious accessories that are impossible to find. As a stylist, I know accessorisation is essential; it is the personal touch in any outfit. With these pieces, everyonecan have fun and turn an ordinary day into a fantastic fashion day”. Gold and turquoise heature heavily in this opulent collection which features clutches, bangles and stilettos.